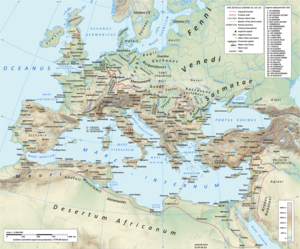 Moesia (/ˈmiːʃə/, /ˈmiːsi.ə/, or /ˈmiːʒə/; Laitin; Greek: Μοισία) wis an auncient region an later Roman province situatit in the Balkans, alang the sooth bank o the Danube River. It includit maist frae the territory o modren-day Serbie (wioot Vojvodina) an the northren pairts o the Republic o Macedonie, (Moesia Superior), as well Northren Bulgarie an Romanian Dobrudja, (Moesia Inferior). ↑ Lena Olausson, Catherine Sangster, ed. (2006). Oxford BBC Guide to Pronunciation. Oxford University Press. ↑ "C. Suetonius Tranquillus, Vitellius Maximilian Ihm, Ed". perseus.tufts.eud. This page wis last eeditit on 10 Januar 2014, at 18:53.